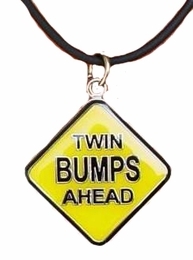 A modern and unique gift for the expectant mother of twins! Pendant is 1" X 1" and enamel. Rubber necklace (18") with sterling clasp. Falls nicely below the collar bone...not too long, not too short.